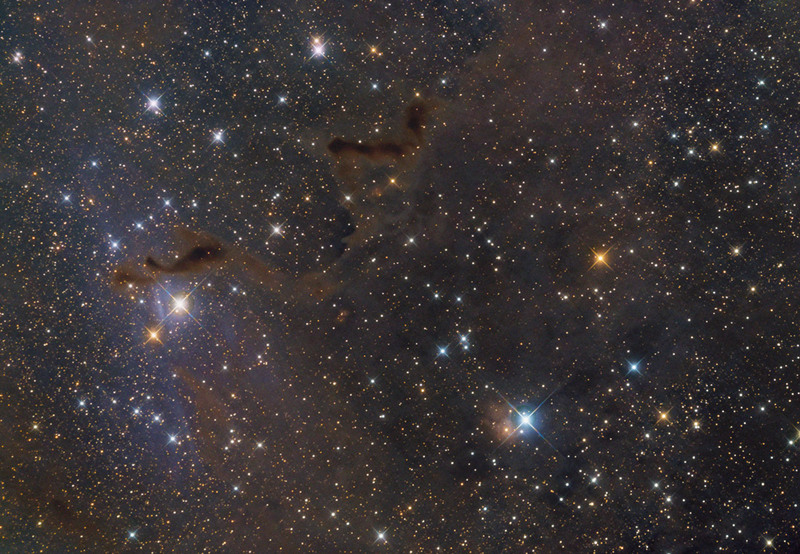 This image, showing the aria adjacent to VdB 8, includes the reflection nebulae VdB 7 and VdB 9 and also several dark nebulae (please see the annotated mouseover image just below this text). Vdb 7 lies in proximity to the spectral class A3 eclipsing variable star RZ Cassiopeiae, which heavily penalizes its observation. The nebula is located just to the south of this star. The illuminating star however is not RZ Cassiopeiae, but a much weaker star, of eleventh magnitude. Regarding VdB 9, its illuminating star is the fifth magnitude SU Cassiopeiae, a white-yellow dwarf Cepheid, placed at a distance of about 1,400 light-years from the Solar System. The image of VdB 7 and VdB 9 (right part of the image above) is reprocessed from raw data taken back in July 2012.